Islamic and Middle Eastern studies are cognate academic disciplines, but scholars in both fields often go about their research in relative isolation from each other. Various reasons account for this, not least institutional ones: Middle Eastern Studies and Islamic Studies tend to be associated with separate university units (and hence with different research methodologies), the former with area studies, the latter with religious studies and theology. Middle Eastern Studies emphasize the political, social and economic organisation of the modern and contemporary Middle East, while Islamic Studies include areas of the Islamic world beyond the Middle East and devote substantial attention to the formative and middle periods of Islamic civilisation. Most controversially, perhaps, the two disciplines tend towards divergent evaluations of the role played by Islam in the history and current configuration of the Middle East. Yet in spite of these dissimilarities, researchers in both areas, in many fruitful ways, benefit from each others’ work. 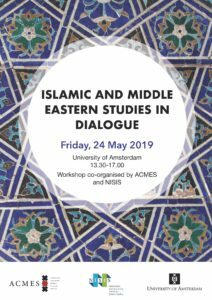 This workshop seeks to facilitate conversations between researchers from both disciplines, by inviting Dr. Maaike Voorhoeve (University of Amsterdam), Dr. Farid Boussaid (University of Amsterdam), Prof. Thijl Sunier (VU Amsterdam) and Prof. Gerard Wiegers (University of Amsterdam) to reflect on common themes, and engaging the broader community of Middle Eastern and Islamic Studies scholars in a conversation about their mutual perceptions and shared research interests. You can register for this event by filling out this registration form. For the course description, please click here.